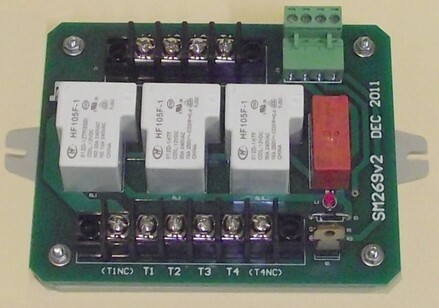 The SM260 is a 4-pole AC Contactor capable of operating from a 12V D.C. supply. It may be triggered by either directly accessing the 12VDC coils of these relays, or by sending a +5V logic-level control signal to the module, which uses the on-board MOSFET to drive the relays. A red Status indicator shows when the contactor is energised. This contactor is suitable for driving AC loads where insufficient supply is available to hold in conventional contactors during motor start events. The relay coils may be directly accessed via the +12 and –RLY terminals, or by applying 12V to the +12V and 0V terminals, then providing a low-current +5V signal to the CTRL input.